The author of one of my favorite books, Fahrenheit 451, Ray Bradbury (1920 – 2012) once quipped “You’ve got to jump off cliffs, all the time, and build your wings on the way down.” I love this quote because it captures the essence of what I’m trying to do here at the Honest Apothecary – help you build wings! Have you ever thought about becoming a Certified Pharmacy Technician? In three previous blog posts (Here, Here, and Here) I have interviewed actual pharmacy technicians who have shared with you what the career actually looks like. In this post – I would like to tell you how YOU can become a certified pharmacy technician yourself. You can get all the training and preparation you need right in the comfort of your own home! 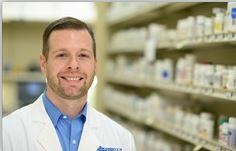 My friend and fellow-pharmacist Steven Pettit has created an instructional series of videos available online at Udemy for a very reasonable price. Normally this course will run you $199, but we’ve negotiated a BIG discount just for my readers here at The Honest Apothecary, so read on! I’ve invited Steven to come and talk to us a little about himself, about being a certified pharmacy technician (CPhT), and about the course he provides for anyone at Udemy. Please join me in welcoming my friend Steve Pettit. 1) Steven thanks for sharing with us here at The Honest Apothecary. Could you tell my readers about yourself and your career as a pharmacist? I was looking for a career that involved both science and helping people. When I was a child with a chemistry set, I would mix together random chemicals that made a pretty color. These were “magic potions” that I was certain would cure the world’s sickness. Somehow my potions never made it to market. The FDA probably would have turned up their nose at a 10 year old being the lead researcher anyway. During my time in college I realized that a pharmacy career would satisfy most of what I wanted. The schooling was brutal but it certainly has been a rewarding career. My desire to help patients is satisfied every day by medication counseling. I work at an independent pharmacy that specializes in custom compounded medications. The chemistry set has been replaced with actual lab equipment and the “potions” created out of the pharmacy actually do help with sickness. After some time in a pharmacy, my desire to educate others crept in. I taught Pharmacy Technician courses at the local community college at night to satisfy that need. I knew that those students were paying too much, but I also knew that they were going after a good job that would more than pay the cost of tuition. 2) What are your thoughts about a career as a pharmacy technician? It is difficult to put into words just how important a good pharmacy technician is to the pharmacy team. If the pharmacist is the head coach of the pharmacy team, the technician is the quarterback. The best pharmacist in the world can be rather ordinary without a great CPhT to assist. Many individuals start in the job thinking that they will only stay for a short time – only to find that they actually enjoy the job and eventually turn it into a career. The satisfaction of knowing your patients by name and being an important part of the healthcare team are benefits that some technicians just don’t want to give up. Becoming a pharmacy technician is a fantastic choice for a career. The salary is growing and the job market is expanding at a fast rate. Possibly the best factor is the variability of jobs one can get with a pharmacy technician certification. Hospital, Retail, Mail Order, or Long Term Care – technicians have numerous options available that can fit their schedule and work environment needs. 3) How exactly does someone become a pharmacy tech in the U.S.? The process varies from State to State but for the most part the path is simple. Interested individuals should first look into working as a cashier in a pharmacy. This is a non-technical position that you will not need to be certified for. The experience you receive is very valuable and it is a foot in the door to a pharmacy technician position with that pharmacy. This step is not a requirement. Certification: Many States require certification. This can come from one of two organizations, the PTCB and the ExCPT. Most states require the PTCB, but many are adopting the ExCPT as well. Some states/ employers will even allow you to work as a pharmacy technician without certification but will offer a promotion (usually a raise!) whenever certification is obtained. Both organizations test the minimal skills needed to be a competent pharmacy technician. Students can use a local community college to study for this exam or simply study on their own. Find more information on the certification needed here: PTCB and ExCPT. Experience: Some states require several hours of experience at a pharmacy before they will certify you as a pharmacy technician. In these states you will need to find employment/volunteer opportunities under the direction of a pharmacist. Upon completion, the pharmacist will sign documentation stating that you have completed the required hours. Some community colleges will offer this experience as part of their package. Not all states require experiential hours – check with your local state board of pharmacy! Registration: After your states requirements are met, students must send in the required documentation to their local state board of pharmacy. Once your state board of pharmacy approves your application, you are will be a certified AND registered pharmacy technician. Won’t your name look great with the initials CPhT following it? 4) Could you tell us a little about Udemy and the program you developed to help prepare pharmacy technicians for the exam? Udemy is the web home of 1000’s of online courses that teach a variety of different skills. From technology to yoga, various experts in their respective fields are a click away to spread their knowledge. College education has become more and more expensive. Sites like Udemy are giving options to individuals to further their education without having to take the time to attend class in a traditional classroom. 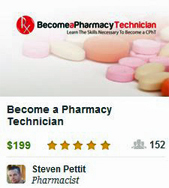 Udemy provided a great platform for me to teach the skills needed to become a pharmacy technician. Students can learn at their own pace and even their own time schedule. If a student wants to watch a lecture 10 times at midnight – they have the freedom to do so. For an information intensive career such as pharmacy technician, this freedom can be very valuable. My course is designed to teach a student the various skills that may be tested in the PTCB or the ExCPT. The first few lectures start out with pharmacy workflow and prescription insurance – some really simple tasks that occur every day in a retail pharmacy. My goal in creating the course was to make the material simple enough that someone who has never stepped into a pharmacy could understand what was expected of them as a pharmacy technician. While taking the course students will find quizzes, handouts, and supplemental links that can augment the video lectures. Anybody that has taken the certification exam will tell you that there is a great deal of math on the exam. I knew that simply reading a book on how to perform pharmacy math wasn’t sufficient for most students. To rectify that problem, I mounted a camera above my hands while I narrated what I was doing at each step of the math problem. Although reading how to do a math problem can guide a student, seeing the problem worked out on the screen is much more helpful. In short – web based study tools are more flexible for students with busy lives. The era of mandatory schooling for certain trades is ending. Well I want to thank Steven for participating in this interview. If you have questions about the Pharmacy Technician Certification Course please post them below and we will get you some answers. So, are you ready to build your wings? Then this course is for you. Pharmacy technicians are growing in demand, and salaries are on the rise. But you need to do something. You have to take the first step. And this course is one great way to begin! Okay. Now I need to keep my promise. Steven’s course normally goes for $199.00. When compared to the tuition some pharmacy technician schools are charging, this is already an unbelievable deal for a course that you can watch and watch as many times as you want. However, in the interest of providing you an amazing opportunity and truly encouraging you to BUILD YOUR WINGS, we are able to offer you this course for ONLY $49.00! Yep, that’s 75% off the regular price. You get all 34 lectures, the helpful quizzes, online access to ask questions, and an excellent preparation for the certification exam. Here’s the link one more time: YES – SHOW ME THE $49.00 CERTIFIED PHARMACY TECHNCIAN COURSE FROM Udemy! It is my sincere hope that many of my readers who may have been thinking about pursuing a career as a pharmacy technician will be motivated by this interview, and the fantastic offer, to take the next step and begin to prepare themselves for certification. Yes, it will take some effort. But the time couldn’t be better, and neither could the price. So think about it, think about your future, think about an opportunity to make an investment in a rewarding and diverse career – and sign up for this online tutorial today. Best wishes! Disclaimer: My arrangements with Steven to discount this course for my readers includes a small commission to me if/when a student signs up for this course via links from this site. I won’t be quitting my day job…LOL. And you should know that Steven did not pay to have me recommend his course. I don’t do that. I’m talking about it because it is good material (yes, I’ve viewed it) and want to share it with others. Every state has different requirements for working as a Pharmacy Technician. Some states require national certification and some don’t. Whether required by one’s pharmacy state board or not, having this certification will definitely help you stand out from the competition. Being nationally certified not only shows employers your knowledge and skills have met nationally recognized standards, but also the customers and your peers.